Portland State University Library will be closed from Saturday, December 19, 2015 through Saturday, January 2, 2016. We will re-open on Sunday, January 3 at Noon. 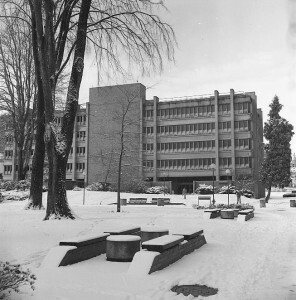 PSU Library in January, 1982. Photo from the University Archives Digital Gallery. During the closure, we will not process Summit and Interlibrary Loan borrowing requests. You may submit these requests during the closure, and we will begin processing accumulated requests on Monday, January 4. Have a wonderful break, and we’ll see you in the New Year!